Standard chess remains way too big to be solved but the game-theoretic value of smaller variants can be found. Previous results by Kyril Kryovich gave strong resolution for 3x3, 3x4 and up to 9 pieces in 4x4 by giving the Distance To Mate (dtm) of all legal positions. In this page we study bigger variants (but smaller than regular 8x8 chess). 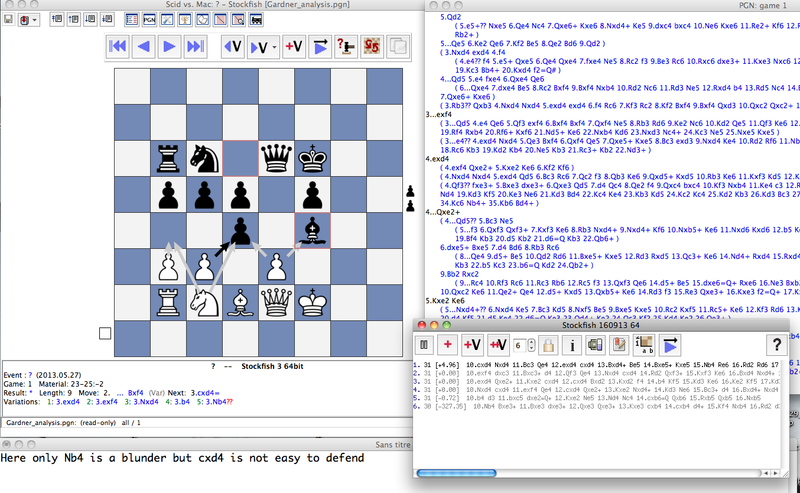 We mainly use adapted versions of Stockfish as a basic resolution engine. In our analyses we consider only games where at least one player plays perfectly. It allows to considerably reduce the number of positions to analyze and is sufficient to caracterize the game (we do not consider games in which both players make bad moves). A 5x5 minichess engine based on Stockfish. A 5x5 graphical user interface has been built based on ScidvsPC. It is particularly useful to use this GUI when promotions occur in the game. The Gardner minichess variant has been proved to be a draw. The paper can be found on here. a pdf document, included are the list of all four valid openings together with some difficult checkmates. a pgn downloadable file. Note that this is a not a usual pgn file, it is much larger, as it contains all correct moves up to depth 5 (together with many variations to help to understand the positions). a browsable version of the pgn file. Here follows two screenshots of the engine and the graphical user interface. 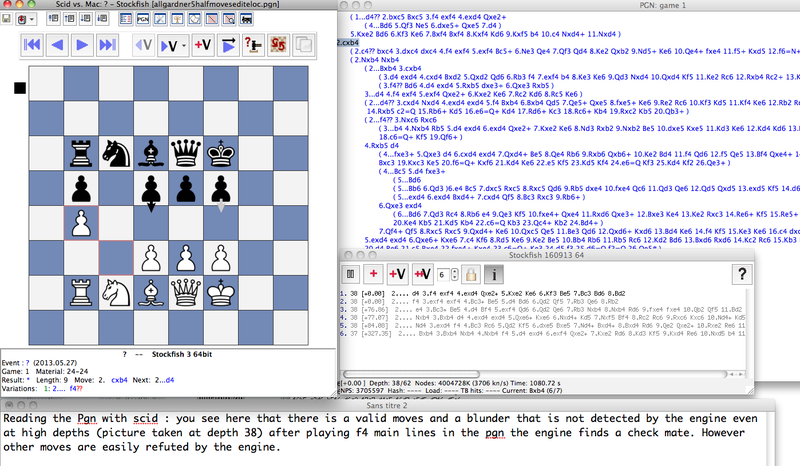 These screenshots show that the engine is not sufficient for the complete analysis of Gardner Minichess positions. The justifications are given in the pgn file. If you have any questions feel free to contact either Frederic dot Prost at imag.fr or Mehdi dot Mhalla at imag.fr.